Abbotts Square, on the 200 block of South Street. 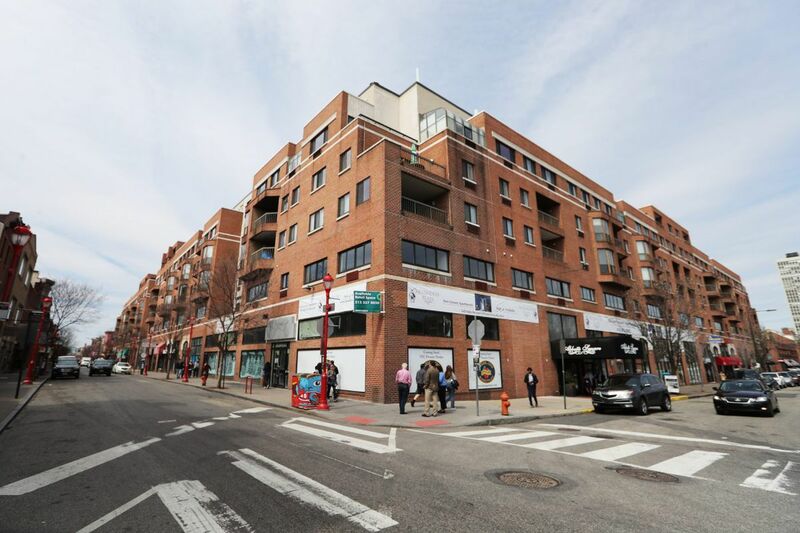 Philadelphia developer Eric Blumenfeld’s lender at his Abbotts Square residential and commercial complex on South Street is moving to foreclose on his portion of the building, claiming that he is in default on more than $30 million in debt against the property. U.S. Bank N.A. said in a court filing last month that the Blumenfeld entities that own the building’s commercial space, apartment units and parking lots at Second and South Streets — although not most of its condos — have been in default on their loan since October. That’s when Blumenfeld failed to make a required $700,000 deposit into an account set up to hold money that someday could be needed to replace commercial tenants in the property, according to the complaint filed March 22 in U.S. District Court in Philadelphia. Abbotts Square’s vacancies have long been a drag on South Street’s commercial vitality, although new tenants — including Giant Food Stores LLC’s smaller-format Giant Heirloom Market and Orangetheory Fitness — are said to be opening locations soon at the property. The complaint was filed by Minneapolis-based U.S. Bank on behalf of investors who share ownership of the mortgage. U.S. Bank did not immediately respond to a phone message seeking comment. LNR Partners LLC, which was assigned to the Abbotts Square mortgage as a special servicer — a type of real estate company that manages troubled debt — also did not respond to a message. LNR Partners is a unit of Starwood Capital Partners in Greenwich, Conn.
Blumenfeld, whose other projects include the recently completed Metropolitan Opera House concert venue and the Divine Lorraine apartments on North Broad Street, said the Abbotts Square notice of default came as a surprise; he said he had never missed a payment on the loan. He said a mortgage split among investors was never a good fit for a property such as Abbotts Square that combines multiple uses and demands occasional retrofitting for new ones, because there’s no single lender with whom to strategize. Blumenfeld is working on a modification with the loan’s servicers that would pull him out of default, he said. The foreclosure action is the latest patch of trouble for a property that’s struggled to gain a footing since its original developer, Eric Blumenfeld’s father, Jack W. Blumenfeld, demolished the former Abbotts Dairy building at the site in 1982. The property, bounded within South and Lombard Streets between Second and Third Streets, remained an empty, rubble-strewn lot that angered neighbors for 18 months until the elder Blumenfeld had the plans and financing in place to break ground on the five-story condo and commercial building. By 1989, with few of the building’s units sold and neighborhood opposition scuttling plans for a big sports bar on an undeveloped part of the property, Jack Blumenfeld narrowly avoided foreclosure following negotiations with his bank. When Eric Blumenfeld and his brother David — who is no longer an owner — bought the building later that year, 101 of its 162 condo dwellings were still for sale, Eric Blumenfeld said. The number of condos in the building has since increased to 171, only 11 of which Blumenfeld continues to own, he said. And for a while, the property was drawing crowds with a popular branch of the TGI Fridays restaurant chain and a comedy club most recently known as the Laff House. But by mid-2016, TGI Fridays was gone; the Laff House and a Citibank branch were soon to depart, and grocer Garden of Eden had canceled a plan to occupy space in the property. The confluence of losses sent Blumenfeld’s loan into the hands of a special servicer because of what was seen as an imminent default, according to a report by debt tracker Trepp LLC. Blumenfeld has since then staved off foreclosure through a series of forbearance agreements reached with his lender, one of which required the $700,000 reserve deposit within 90 days of its signing in July 2018, according to the foreclosure complaint. When the October 2018 due date passed without the deposit, U.S. Bank declared Blumenfeld in default, saying it was owed the loan’s full principal balance of nearly $23 million, plus interest, fees and penalties for a balance of just over $30 million. “The amount currently owed by borrower on the loan is more than $30 million, which ... exceeds the fair-market value of the property,” lawyer Quaglia wrote in a separate filing asking the court to appoint a receiver to manage the property on the lender’s behalf. The receiver would be a team involving personnel from IVL Group, a Montclair, N.J.-based property manager, and commercial real estate firm Colliers International in Philadelphia, according to the filing. The foreclosure action follows Blumenfeld’s resolution of a lawsuit by commercial services firm CBRE Group, which had alleged that he didn’t pay a broker who helped him secure a grocery tenant to take the space never occupied by Garden of Eden at Abbotts Square. Blumenfeld had argued that CBRE wasn’t due its entire commission because the tenant, a branch of Dutch supermarket giant Ahold Delhaize’s since-abandoned Bfresh grocery-store brand, never actually took occupancy, although it has been paying rent. Blumenfeld said Monday that he had settled with the firm in exchange for an agreement to pay the brokerage a sum of money, which he could not disclose, citing a confidentiality agreement. A CBRE spokesperson did not immediately respond to a request for comment. Abbotts Square’s tenancy woes may be moving toward a resolution, too. After abandoning the Bfresh brand, Ahold Delhaize devised a new urban-format store known as Giant Heirloom Market under its Giant Food Stores division, opening its first location in January at Bainbridge Street and Grays Ferry Avenue. Giant has since announced that it would open an Heirloom store at Abbotts Square before the end of the year, alongside two others planned in central Philadelphia. With the planned addition of an Orangetheory Fitness gym, the property’s commercial space will be almost entirely occupied, said Blumenfeld, who was confident that he’d find a way to stay on as its landlord.